Each team opened spring training, staying in the same environment, which sets their hitting instincts (muscle memory and visual memory) to that climate. Then, at the beginning of a season, it takes approximately three home stands for a team to settle in to its own environment. Once they settle into their home environment, the road trips become more and more confusing, and the visual memory impairment is more pronounced. Some of the teams go directly from Spring Training in either Arizona at 1,200 ft. elevation and 80 degree temperatures with 15% humidity (61 ADI); or from Florida at less than 150 feet elevation, but 85 degree temperatures and 60% humidity (63 ADI) to the Northern States in the Midwest where it is often cold in early April. While the elevations in the northern Midwest are between 600 and 1000 feet, making the air a little thinner; the temperatures do not warm to 85 degrees until June. Many of the games are cold; often in the low 40 degree temperature ranges, causing the air to be much heavier. The Air Density Index (ADI) often exceeds 70 ADI in these conditions, even though the altitude is higher. This was the case when the Kansas City Royals met the Detroit Tigers on March 31st 2014 in Detroit. When a team is exposed to straighter pitching due to lighter air resistance, they suffer for it when they move to a new venue where the air is “Heavy” and the pitches have more movement on them. Research shows, “a team with a VMI score close to zero will get a hit on an average of over 13% of the fastball strikes thrown by the average MLB pitcher. 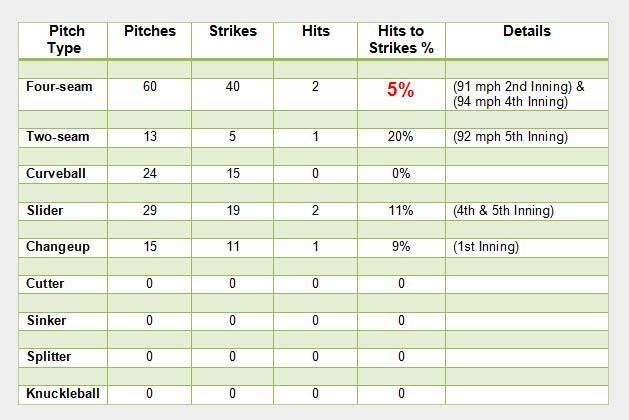 A team with a high negative VMI score, such as a team leaving Colorado for San Francisco, (or a Central Division team leaving for the East or West Division) will get a hit on about 6% of the fastball strikes thrown by the average MLB pitcher.” Of course, a team can do substantial adjusting during the course of each game, but only if they are seeing an adequate number of fastballs. Other pitches are easier to adjust to, as they are all downward breaking, so a team can win while they are adjusting if the opposing pitcher does not recognize the advantage he has when using the lifting fastball. The summary below shows that the Royals performed exactly the way the research indicates they should. 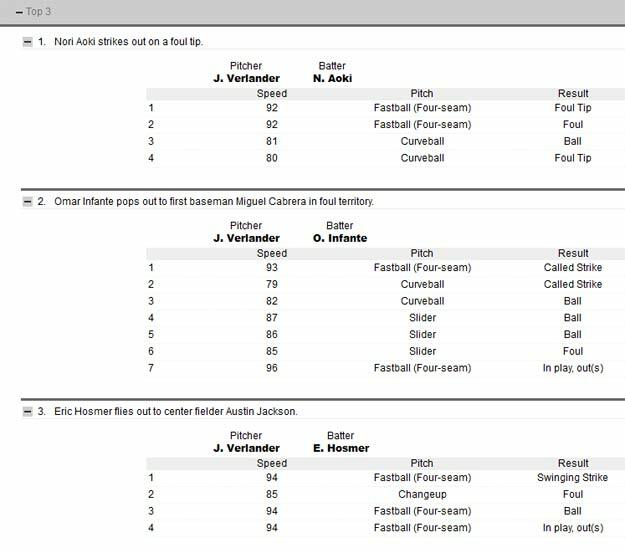 Below is the actual pitch-by-pitch re-cap for the Royals’ hitters third inning, showing the speed and result of each pitch by Justin Verlander (who had less velocity than in 2013). Note, that the entire play-by-play is available on Major League Baseball's game-day site. (When visiting this page, select 'Play-by-Play', then click the plus sign (+) by any player to expand the pitches and results.) You may also view any other inning of this game related to the Royals.